Written by Tim Ingham — 2015 was a historic moment in the history of the LP in the United States, but not one that will delight many A&R executives. It was the first year in living memory in which catalogue album sales overtook those of ‘current’ releases. According to Nielsen data, catalogue albums – which it defines as any release over 18 months old – shifted 122.8m copies in 2015 in the US, down 2.9% on 2014’s tally of 126.5m. Current album sales, however, dropped by an even more hurtful 9.2%– down from 130.5m to 118.5m. Just look at the decline in the green bar below to see how the balance of power has shifted. Interesting to think that Adele’s 25 contributed 7.44m of those 118.5m ‘current’ album sales – 6.3% of the total. Without her, catalogue albums would have been 11.7m sales clear of their modern day counterparts. Quite amazing to think that ten years before, ‘current’ albums outsold classic releases by 150m units. 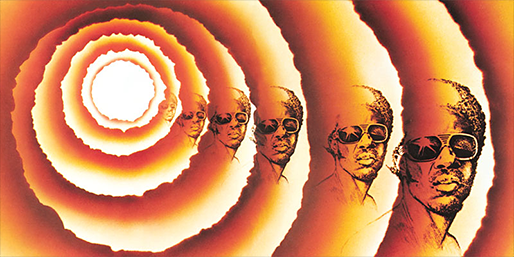 The biggest factor in catalogue’s overtaking of new albums in 2015 was physical LP sales. 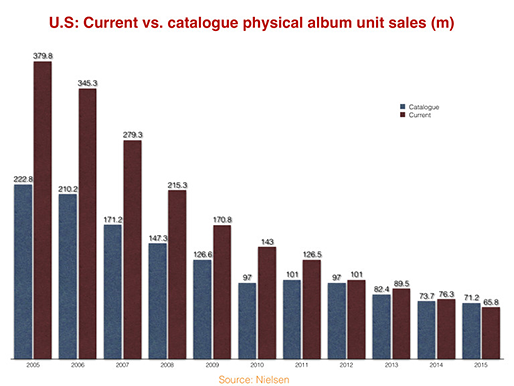 According to Nielsen, 71.2m catalogue albums were sold across CD and vinyl in the year – down 2.7% – while 65.8m non-digital current albums were shifted. As you can see, this was another historic milestone for the album format. 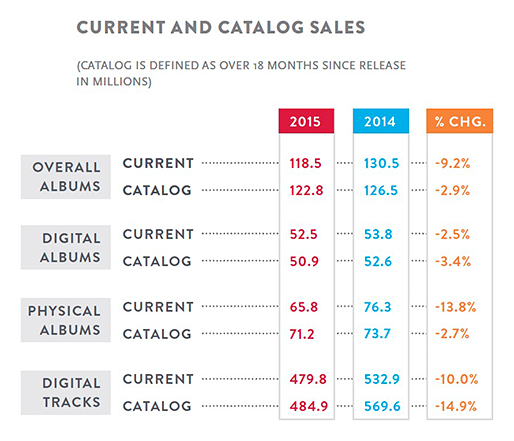 In terms of digital album sales, current albums were still slightly out ahead in 2015. Current digital album sales (predominantly on iTunes) were down 2.5% in 2015 to 52.5m, while catalogue sales dropped by a steeper 3.4% to 50.9m. Yet in terms of digital track downloads, catalogue was king once again. 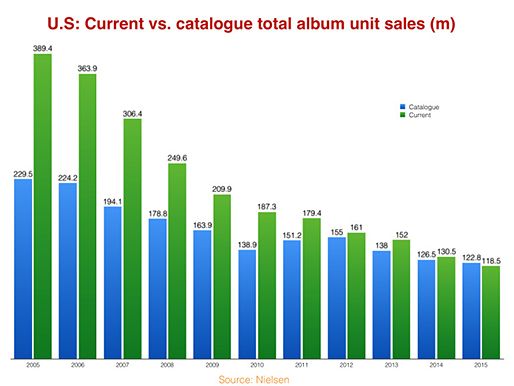 Catalogue tracks sold 484.9m in total in the US in 2015, according to Nielsen – down 14.9%. However, this was still ahead of the tally for tracks released in the previous 18 months, which fell 10% to 479.8m. Nielsen didn’t give catalogue vs. current figures for streaming platforms. You can forget the idea that ‘albums are becoming irrelevant anyway’. 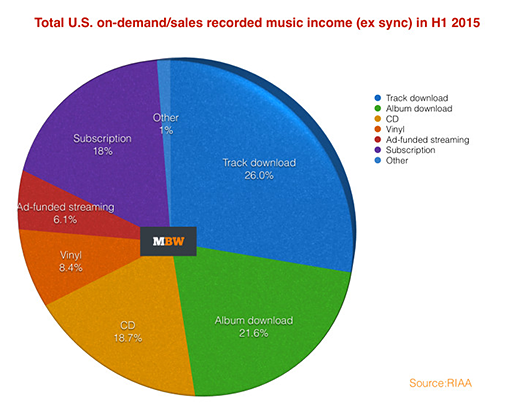 According to RIAA data for the first half of 2015 (we’re waiting on the full year stats), 48.7% of the US recorded music market’s total income came from CDs, vinyl and digital albums combined. The list of biggest selling vinyl albums in the year was replete with plenty of catalogue releases – but not at the very top. Adele’s 25 was the most popular vinyl release of the year with 116,000 sales, followed by Taylor Swift’s 1989 on 74,000 sales. The biggest catalogue album was at No.3: Pink Floy’d Dark Side Of The Moon, with 50,000 sales, followed by The Beatles’ Abbey Road (No.4, 49.8k sales) and Miles Davis’ Kind Of Blue (No.5, 49k sales).